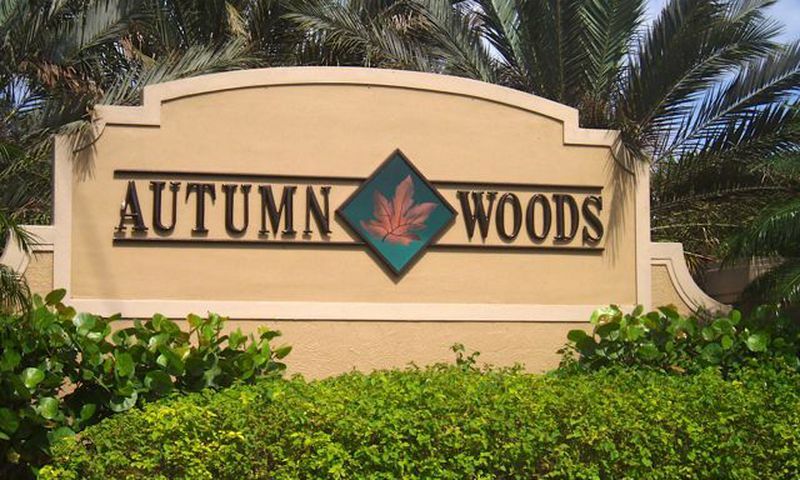 Autumn Woods is an active lifestyle community nestled near the sun-drenched beaches of Naples, Florida. This gated development offers a range of condominiums, villas and single-family homes on approximately 225 lushly wooded acres. Autumn Woods residents also enjoy a range of amenities including a clubhouse overlooking a sparkling lake, outdoor pool, tennis courts and stocked fishing ponds. Within the community, acres of natural preserves and lakes offer protection to many species of birds and wildlife. Autumn Woods features a 3,000 square-foot clubhouse that is the hub for fitness, hobbies and planned social activities. Line dancing, water aerobics, Mah Jongg and knitting are just a sample of the offerings available here. For those who want to focus on their physical health the fitness center has everything you will need from cardio equipment to free-weights and machines. Outdoor enthusiasts will love Autumn Woods for its miles of biking and jogging paths, two tennis courts as well as its resort-style pool and spa. There's even a playground and children's wading pool. Centex began development of Autumn Woods in 1998 and completed the community in 2003. This resort-style community encompasses 350 single-family homes, 110 villa homes and 88 coach homes in three different neighborhoods. The Cedar Ridge neighborhood offers low-maintenance attached coach homes. These homes have an attached garage with first floor master bedrooms. Villa homes offered in the Maple Brook neighborhood give the residents slightly more living space than a coach home but with the easy low-maintenance lifestyle. The Mahogany Run and Oak Hallow neighborhoods offer beautiful single-family homes. Each home has at least 2 bedrooms with an attached garage. Autumn Woods residents enjoy an enviable outdoor lifestyle. Dubbed the crown jewel of Southwest Florida, Naples offers miles of soft, white sand beaches and calm seas. Friendly parks beckon sports enthusiasts and picnickers with lovely green spaces and recreational facilities. Autumn Woods homeowners can also indulge in plenty of cultural options. Entertainment venues range from the Naples Philharmonic Center for The Arts to local nightclubs. An abundance of restaurants ranging from fine dining to fast food are just a short distance away. Also nearby are churches, synagogues and the Collier County Library. Autumn Woods is located on the east side of Goodlette-Frank Road, one mile north of Pine Ridge Road. Naples' finest beaches, as well as numerous malls, specialty stores and dining establishments are within a few miles. Only 2.5 miles away from the Gulf of Mexico this area provides endless recreational activities and culture. There are plenty of activities available in Autumn Woods. Here is a sample of some of the clubs, activities and classes offered here. The Cedar Ridge neighborhood of Autumn Woods offers attached coach homes. These models are offered between 1,488 and 1,960 square feet. All residences have attached garages. Please Note: Floor plans are not available at this time. Autumn Woods offers villas in the Maple Brooke neighborhood. These villas range between 1,584 and 1,832 square feet and all floor plans come standard with a den. Please Note: Floor plans are not available at this time. The Mahogany Run and Oak Hollow neighborhoods offer beautiful low-maintenance single-family homes. All homes offer at least 2 bedrooms and have attached two car-garages. Please Note: Floor plans are not available at this time. 55places.com is not affiliated with the developer(s) or homeowners association of Autumn Woods. The information you submit is distributed to a 55places.com Partner Agent, who is a licensed real estate agent. The information regarding Autumn Woods has not been verified or approved by the developer or homeowners association. Please verify all information prior to purchasing. 55places.com is not responsible for any errors regarding the information displayed on this website.